A bucket of garlic, with the dirt still on it. Last fall I planted around 50 cloves of garlic- just the boring kind from the grocery store. How do I know how many? Because I just harvested 50 heads of garlic, each of which started from a clove. I don’t know if this will be a year’s supply- I know we don’t buy garlic every week, so 50 should certainly get us through the year, but many of the bulbs I harvested are smaller than the typical grocery store bulb. And, I need to save out some to plant again this fall. Late September last year, I got a few heads of garlic, broke them up and put them into the ground- half into a brand new bed by the hillbilly goldfish pond and the other half in the Boy’s garden- a 2×2 space that I dedicated to him a couple of years ago so he wouldn’t dig holes randomly. Also, I was hopeful that if he was participating in his vegetable growth, he would be less picky. Not so much. I talked him into the garlic because he does like garlic bread… I planted the cloves about 2 inches apart, which was too close, it turns out. Next year, more space between. Last week, the leaves were going brown, so I researched when to harvest, and discovered that the time to harvest was in fact, when the leaves were going brown, and while the soil was dry. The thunder was starting to reverberate while I was on the internet, so I went out before the rain came, so I could dig while the soil was still dry. I was extremely conscious of the metal digging fork in my hand as the storm moved in. Got it dug up and into a bucket before the rain, driven diagonal by the wind, came in. 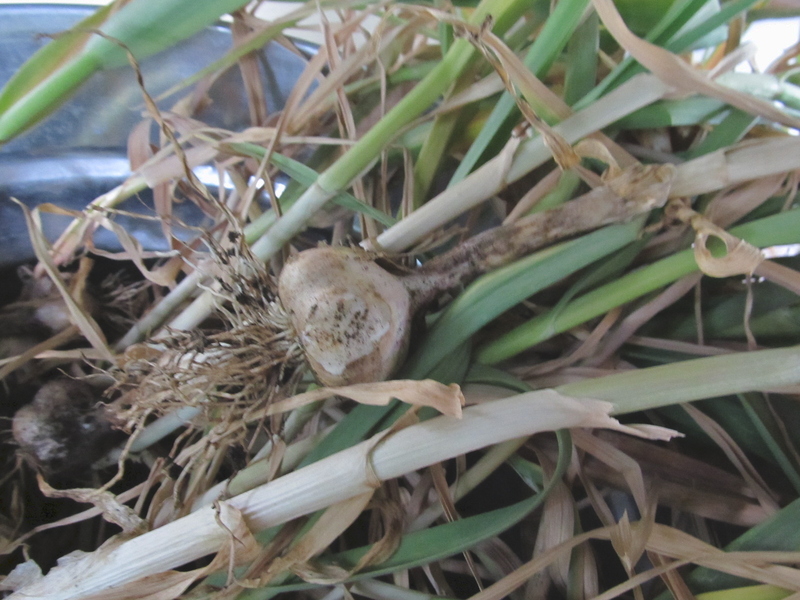 The garlic is curing now- I knocked most of the dirt off the roots, and put the plants into bunches of about 20. I tied twine around the bunches, and I’ll hang them up in the garage, hopefully somewhere where I won’t bump into them every time I go in there. After they cure for a couple of weeks, I’ll trim off the roots and stems and store them in the basement. I got most of my info from the fine people at http://www.gourmetgarlicgardens.com/growing.htm which has great quirky information- more than you think you need to know about garlic, the native american flute and southwest US petroglyphs. it’s a rabbit hole right after my own heart. You might be wondering, why grow your own? it is cheap and legal at the grocery- per pound, it might be the cheapest produce around. Think about this- if your garlic comes from California, or China, what does it take to ship it here? What kind of pesticides and fertilizer? What’s the carbon footprint of your garlic butter? With very little work, and very little space, I have what I hope is a year’s supply.